UDM Downloads > Digital Audio CD Burner! Digital Audio CD Burner is designed to burn MP3, WAV, WMA, and OGG files to an audio CD playable in any standard CD player. The great feature makes Digital Audio CD Burner the perfect audio burner for users of any experience level! 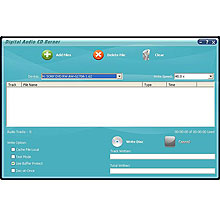 Digital Audio CD Burner is expert music CD burning software with simple settings. It can burn music CD from most video and audio formats, including AVI, MPEG, WMV, ASF, MOV, MP3, 3GP, RM, MP3, WMA, WAV, AU, M4A, RA, OGG, AAC, AC3, etc. It is outstanding in music burning and its easy-to-use interface helps you to catch on to the system quickly.With step-by-step manual, whether you are an experienced user or a beginner, the software will make the task of burning audio files a breeze!